Update (30 Oct 2016): since I wrote this post, a bug was found in the benchmark which caused Rollup to appear slightly better than it would otherwise. However, the overall results are not substantially different (Rollup still beats Browserify and Webpack, although it’s not quite as good as Closure anymore), so I’ve merely updated the charts and tables. 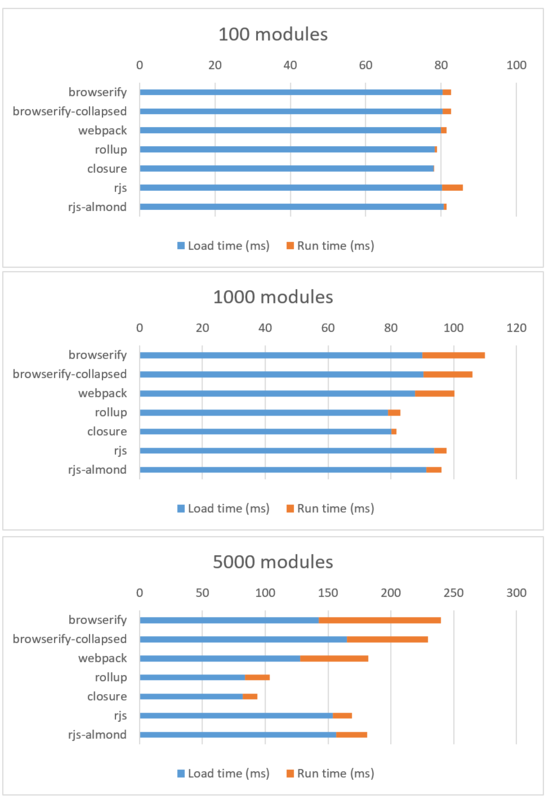 Additionally, the benchmark now includes the RequireJS and RequireJS Almond bundlers, so those have been added as well. To see the original blog post without these edits, check out this archived version. Update (21 May 2018): This blog post analyzed older versions of Webpack, Browserify, and other module bundlers. Later versions of these bundlers added support for features like module concatenation and flat packing, which address most of the concerns raised in this blog post. You can get an idea for the performance improvement from these methods in these PRs. In this post, I’d like to demonstrate that small modules can have a surprisingly high performance cost depending on your choice of bundler and module system. Furthermore, I’ll explain why this applies not only to the modules in your own codebase, but also to the modules within dependencies, which is a rarely-discussed aspect of the cost of third-party code. Rich Harris has already articulated why the “small modules” pattern is inherently beginner-unfriendly, even though it tends to make life easier for library maintainers. However, there’s also a hidden performance cost to small modules that I don’t think has been adequately explored. It’s important to note that, when I say “modules,” I’m not talking about “packages” in the npm sense. When you install a package from npm, it might only expose a single module in its public API, but under the hood it could actually be a conglomeration of many modules. Now consider a slightly more complex package like once, which has exactly one dependency: wrappy. Both packages contain one module, so the total module count is 2. So far, so good. Now let’s consider a more deceptive example: qs. Since it has zero dependencies, you might assume it only has one module. But in fact, it has four! This means that a given package can actually contain one or more modules. These modules can also depend on other packages, which might bring in their own packages and modules. The only thing you can be sure of is that each package contains at least one module. For the record, my own Pokedex.org (the largest open-source site I’ve built) contains 311 modules across four bundle files. 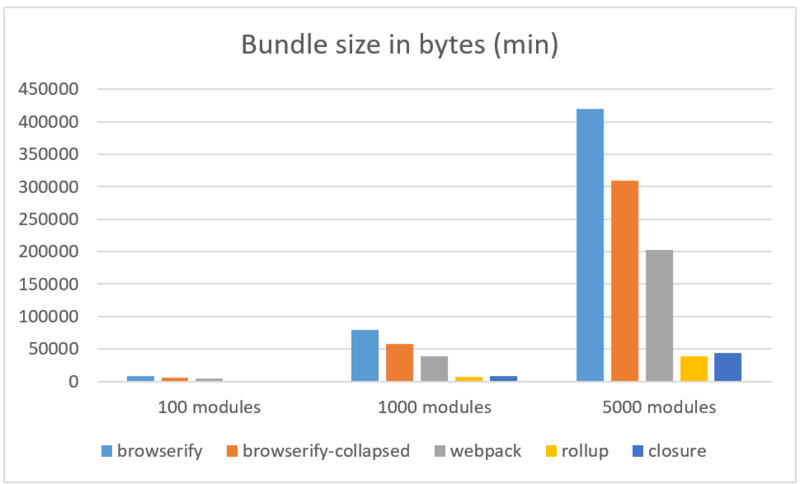 I tested five bundling methods: Browserify, Browserify with the bundle-collapser plugin, Webpack, Rollup, and Closure Compiler. 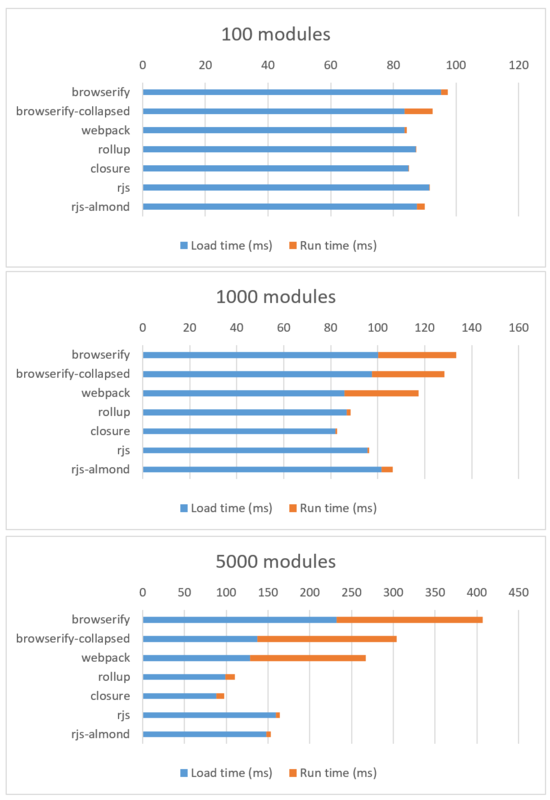 For Rollup and Closure Compiler I used ES6 modules, whereas for Browserify and Webpack I used CommonJS, so as not to unfairly disadvantage them (since they would need a transpiler like Babel, which adds its own overhead). In order to best simulate a production environment, I used Uglify with the --mangle and --compress settings for all bundles, and served them gzipped over HTTPS using GitHub Pages. For each bundle, I downloaded and executed it 15 times and took the median, noting the (uncached) load time and execution time using performance.now(). 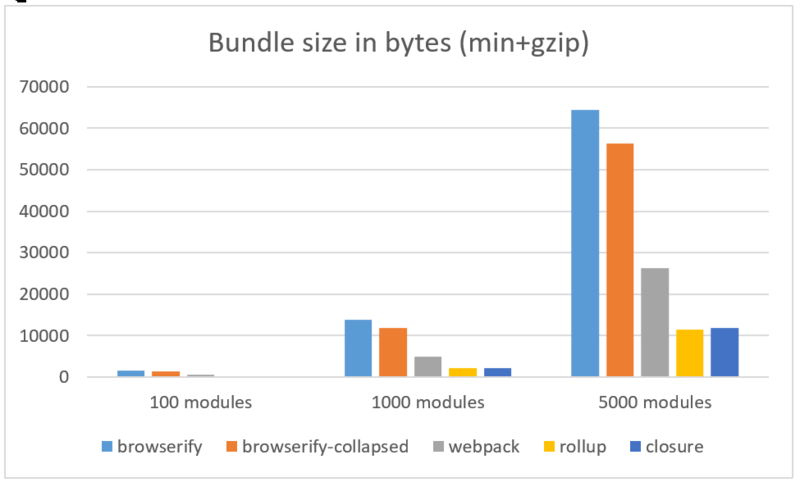 What stands out is that the Browserify and Webpack versions are much larger than the Rollup and Closure Compiler versions (update: especially before gzipping, which still matters since that’s what the browser executes). If you take a look at the code inside the bundles, it becomes clear why. The important thing to notice is that every module in Webpack and Browserify gets its own function scope, and is loaded at runtime when require()d from the main script. Rollup and Closure Compiler, on the other hand, just hoist everything into a single function scope (creating variables and namespacing them as necessary). Update: as noted above, results have been re-run with corrections and the addition of the r.js and r.js Almond bundlers. For the full tabular data, see this gist. I ran this benchmark on a Nexus 5 with Android 5.1.1 and Chrome 52 (to represent a low- to mid-range device) as well as an iPod Touch 6th generation running iOS 9 (to represent a high-end device). At 100 modules, the variance between all the bundlers is pretty negligible, but once we get up to 1000 or 5000 modules, the difference becomes severe. The iPod Touch is hurt the least by the choice of bundler, but the Nexus 5, being an aging Android phone, suffers a lot under Browserify and Webpack. I also find it interesting that both Rollup and Closure’s execution cost is essentially free for the iPod, regardless of the number of modules. And in the case of the Nexus 5, the runtime costs aren’t free, but they’re still much cheaper for Rollup/Closure than for Browserify/Webpack, the latter of which chew up the main thread for several frames if not hundreds of milliseconds, meaning that the UI is frozen just waiting for the module loader to finish running. 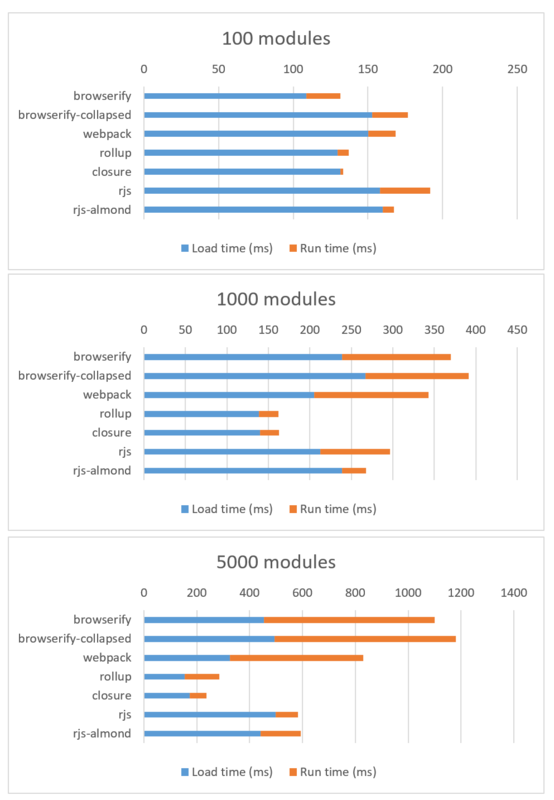 Once we take slow networks into account, the difference between Browserify/Webpack and Rollup/Closure is even more stark. 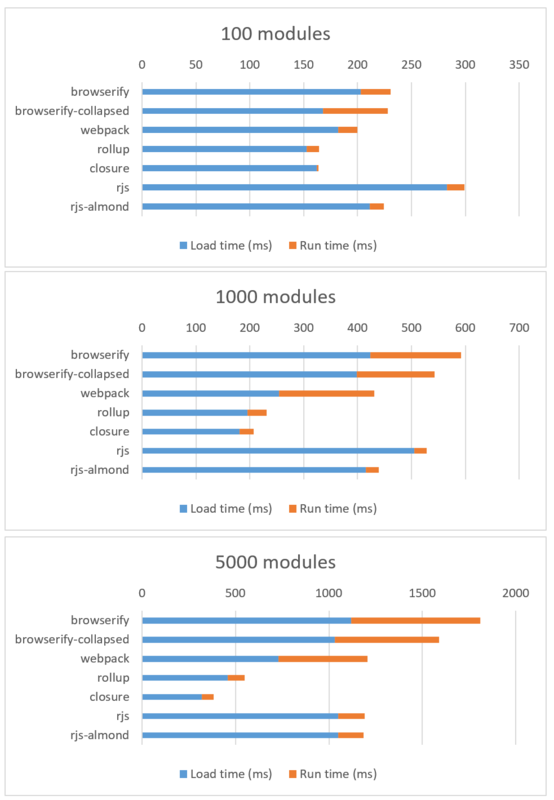 In the case of 1000 modules (which is close to Reddit’s count of 1050), Browserify takes about 400 milliseconds longer than Rollup. And that 400ms is no small potatoes, since Google and Bing have both noted that sub-second delays have an appreciable impact on user engagement. One thing to note is that this benchmark doesn’t measure the precise execution cost of 100, 1000, or 5000 modules per se, since that will depend on your usage of require(). Inside of these bundles, I’m calling require() once per module, but if you are calling require() multiple times per module (which is the norm in most codebases) or if you are calling require() multiple times on-the-fly (i.e. require() within a sub-function), then you could see severe performance degradations. 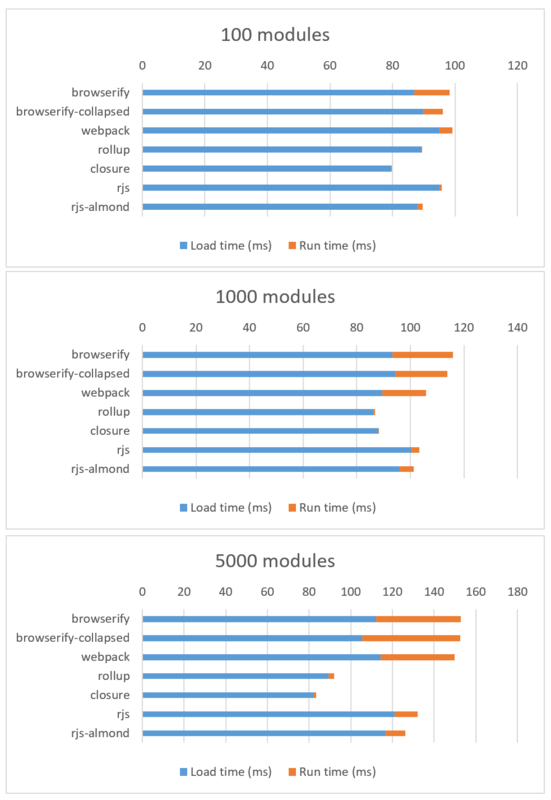 This suggests that it may be worthwhile to run the benchmark again with multiple require()s per module, although in my opinion it wouldn’t be a fair fight for Browserify/Webpack, since Rollup/Closure both resolve duplicate ES6 imports into a single hoisted variable declaration, and it’s also impossible to import from anywhere but the top-level scope. So in essence, the cost of a single import for Rollup/Closure is the same as the cost of n imports, whereas for Browserify/Webpack, the execution cost will increase linearly with n require()s.
I also created rollupify to try to make this pattern a bit easier to just drop-in to existing Browserify projects. The basic idea is to use imports and exports within your own project (cjs-to-es6 can help migrate), and then use require() for third-party packages. That way, you still have all the benefits of modularity within your own codebase, while exposing more-or-less one big module to your users. 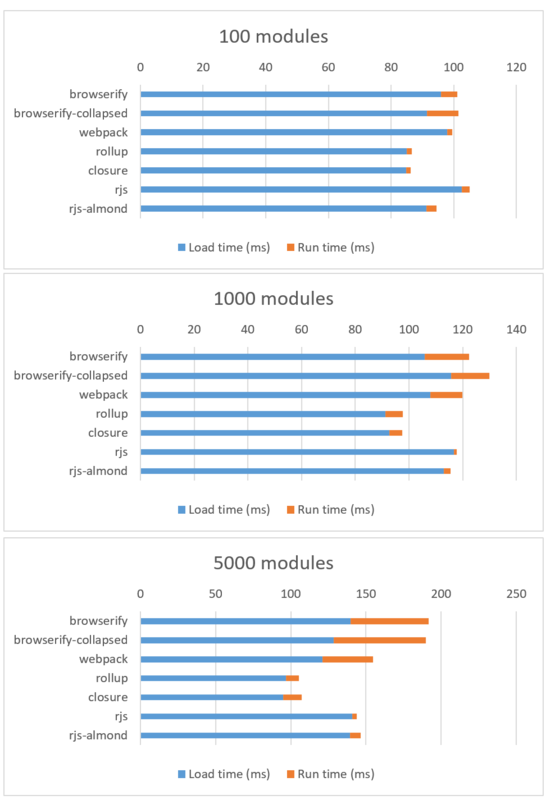 Unfortunately, you still pay the costs for third-party modules, but I’ve found that this is a good compromise given the current state of the npm ecosystem. bundle-collapser is definitely not a slam-dunk in all cases. The ratio of network-to-execution time is always extremely high for Rollup and Closure; their runtime costs are basically zilch. ChakraCore and SpiderMonkey eat them up for breakfast, and V8 is not far behind. Update: in response to this post, JDD has opened an issue on Webpack. There’s also one on Browserify. 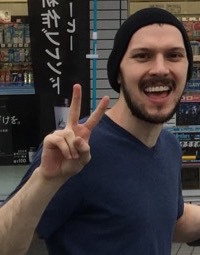 Update 2: Ryan Fitzer has generously added RequireJS and RequireJS with Almond to the benchmark, both of which use AMD instead of CommonJS or ES6. Update 3: I wrote optimize-js, which alleviates some of the performance costs of parsing functions-within-functions.